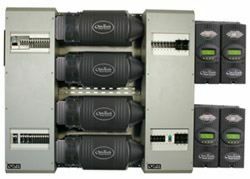 For large residential, commercial or village power systems. The FLEXware 1000 accommodates all of the required protective devices in two enclosures with room for additional breakers and large AC and DC cable connections. The FW1000-AC and FW1000-DC enclosures are both designed to allow mounting in either a horizontal or vertical orientation to provide more installation flexibility and easier wiring connections. The FW1000 system uses two FLEXware MP mounting plates and one set of the optional DCA and ACA conduit adapters for each FX inverter installed. As with all of the FLEXware systems – order the necessary DC and AC breakers, AC input-output-bypass kits and all other additional components separately. FLEXware MP is a one piece, powder coated aluminum mounting plate for FLEXware 500 and FLEXware 1000. The FW-MP make installation quick and easy by including all of the necessary stainless steel hardware to mount both the AC and DC enclosures, inverter/chargers and breakers. Two FW-MP are required for a complete FLEXware 1000 system.